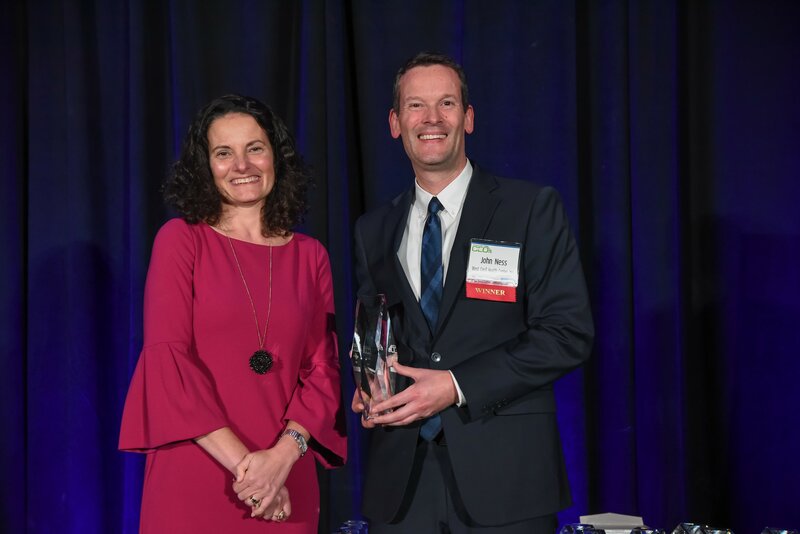 left to right: Suzanne E. Fischer-Huettner, Group Publisher of the Daily Record poses with John Ness, MBA, President & CEO of West Cecil Health Center at the awards ceremony on November 5, 2018 at the BWI Marriott. West Cecil Health Center, a nonprofit, Federally Qualified Health Center providing affordable, accessible healthcare to members of its surrounding community, is pleased to announce John Ness, MBA, the organization’s president and chief executive, has been named one of Maryland’s 2018 “Most Admired CEOs” by The Daily Record. The Daily Record created the “Most Admired CEOs” awards program to recognize talented business CEOs and nonprofit executive directors throughout Maryland for their leadership and vision. The winners were selected based on professional accomplishments, community service and letters of reference submitted by co-workers, board members and community leaders showing the CEO’s leadership and vision. John Ness joined WCHC in 2012 as the organization’s chief financial officer. At the time, the organization was a single-site health center in Conowingo that offered primary care and behavioral health services to the residents of Cecil County. With strategic guidance and leadership skills developed through years of experience forecasting and managing large-scale budgets, Ness helped WCHC expand to locations in Havre de Grace in 2014 and Perryville in 2017, where WCHC now offers affordable dental procedures through a partnership with the University of Maryland School of Dentistry. A life-long Cecil County resident and active member of his community, Ness received his B.S. in Business Administration from West Virginia University and MBA with a concentration in Healthcare Administration from Wilmington University. He currently sits on the board for Maryland Rural Health Association and the Mid-Atlantic Association of Community Health Centers. In his personal time, he is a parent volunteer in his local 4-H club and an active participant in the Cecil County fair each year.